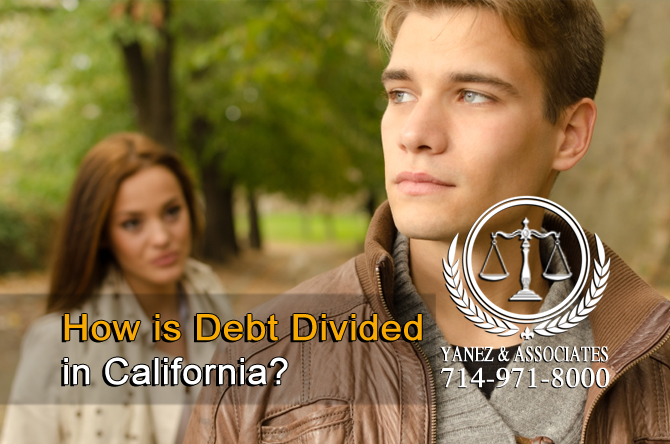 FAQ: How is Debt Divided in an Orange County Divorce or legal separation? When a couple goes through a divorce or a legal separation in California, most people know that they will have to divide all of the property and money that they do have. But, what about what they don’t have - or what they still owe? Debt also needs to be divided in a divorce, and it is divided according to the same laws as property and other assets. California is a community property state, which means that any debt that can be classified as community debt will be divided equally between the two spouses as part of their divorce or legal separation. Debt will have an impact on your financial future, and it is important to work with a skilled attorney and consider using a financial professional to help you divide your debt fairly during your divorce or separation. 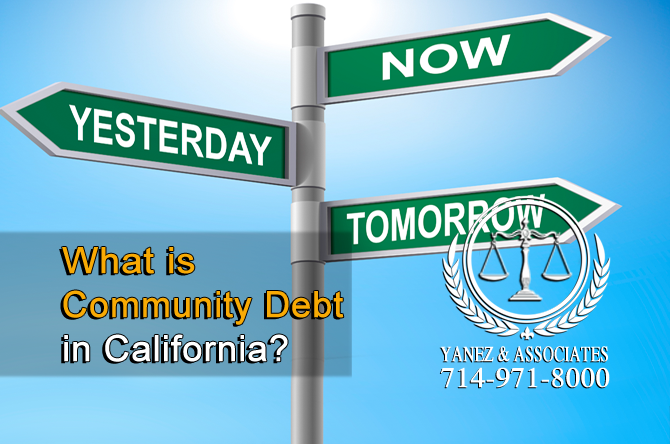 Community property states, like California, require that in order to divide debt in a divorce, it first be categorized as either community debt of separate debt. Generally, debt that was acquired prior to the date of the marriage or registered domestic partnership is considered separate debt, as is debt that was acquired after the date of separation. This means that community debt is any debt that was acquired - by either party - during the marriage or registered domestic partnership. Both parties are responsible for paying debts that were acquired during this time, even if only one spouse or partner took action that resulted in the debt. Determining when debt was acquired may be simple - but sometimes categorizing it as either community debt or separate debt can be complicated, especially without accurate financial records. Sometimes a couple separates before obtaining a legal separation or a divorce, and debts acquired after this separation are not considered community debts. Determining the date of separation can be tricky, and sometimes a court will need to hold a hearing simply to determine the date of separation. In order to determine the date that the couple separated, and to categorize debts as either separate or community, the court will need the answers to a few questions. First, when did a physical separation between the spouses first occur? This might be when one spouse or partner decided to move out of the shared home, or when the couples began sleeping separately, even in different beds in the same home. Second, when did one spouse or partner decide that it was time to end the marriage or registered domestic partnership? This can be when divorce papers were filed, or when either spouse contacted an attorney to discuss divorce. Once debt has been categorized as either separate or community, the process moves to the next step: dividing community debts. How is Debt Divided in California? How will our community Debt be Divided in California? Community debt, like community property, is divided equally between the two spouses. This may mean that each spouse takes half of the community debt, or it may require some negotiation depending on other things like spousal support or how property will be divided. What if we have a mortgage? Dividing things like mortgages can be complicated, especially if one spouse or the couple’s shared children will continue living in the family home. Depending on how the mortgage has been paid for so far, each spouse may be responsible for varying amounts of the mortgage, rather than each spouse being equally responsible for half of it. Sometimes, the a couple might sell the home and instead of working with a debt, they will end up with additional funds, which can be divided between them with the rest of the property. In other situations, the house may need to be refinanced so that the debt is only in one partner’s name, rather than both. Sometimes, one spouse may have contributed significantly more separate funding than the other, so the other spouse may be required to pay more of the mortgage because of it. Much of the mortgage division relies on what will happen to the home after the divorce, and whether either spouse or partner will continue living in it. Credit card debt can be tricky in divorces and legal separations as well, especially because the credit card company can hold both spouses responsible for payment, even if a court decides that one spouse should pay off the credit card debt instead of the other. It is possible to sell certain assets in a divorce in order to pay off credit card debt before finalizing the divorce, which would mean neither spouse would need to worry about paying or a creditor coming after you for debts that your former spouse or partner was responsible to pay. Another option is to have the responsible spouse open a new credit card in his or her own name only, following the divorce, and to transfer the balance to the new card, absolving the other spouse or partner of any legal liability. How Can I Simplify the Process of Dividing Debt in My Divorce? What are some ways I Can Simplify the Process of Dividing Debt in My Divorce? The simplest way to deal with debt when you’re going through a divorce or legal separation in California is to have no community debt when you divorce. Selling property while you are still married and paying off debts beforehand allows you to skip the whole process altogether. However, in most marriages, this is not possible. The following tips can help you divide debts while minimizing the hassle. • Keep accurate financial records. This allows you to know what you have and what you owe. It also simplifies the process of categorizing debt as either community or separate. • Consider loans that are tied to property. For example, if one spouse is taking the minivan, that spouse can be responsible for paying the car payments. • What will each spouse’s financial situation be after the divorce? The more financially stable spouse or partner should take the debts that are not tied to property, like credit card debt. Will one spouse be paying spousal support? Consider lowering spousal support by having that spouse take more debt. • If you are worried that one spouse will not pay off debts for which he or she is responsible, pay it off during the divorce, or before it is finalized. Sell assets and use the funds to pay for debts so that they don’t follow you into your post divorce life. How Can I Build Credit After My Divorce? 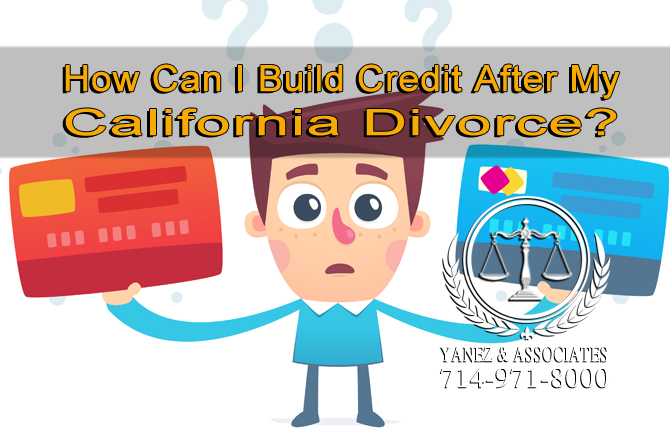 How do I rebuild my Credit After My California Divorce? When you are married or in a registered domestic partnership your credit is tied to your spouse’s credit. After your divorce, your credit is your own - but it has been affected by your marriage. Before your divorce, request a copy of your credit report from a credit-reporting agency, and look at the debts you still owe. You can start working on this before you file for a divorce or legal separation - pay off debts as soon as you can. To rebuild your credit after your divorce, make sure that you have a few things just for you. First, open a bank account in your name. It can be a checking account, a savings account, or both, but make sure that it is in your name and your name only. Apply for a credit card in your name as well. It can be any card, but having one in your name will help you establish credit. Use this card at least once per month, and make sure to pay off the balance in a timely manner. Find an Orange County Debt Division Attorney! Dividing debt in a divorce is not a straightforward process, and it can be complicated. You may need to work with a financial professional. If the process is not done correctly, or if you attempt to divide debts without the help of an attorney, you can face financial issues for years after your divorce. Working with money can also bring out the worst in people, including you or your spouse. It is important to remember that you need to work together to build your financial future, because your future depends on the way your debts and assets are divided in your divorce. Keeping accurate financial records can be very helpful. If you have questions about dividing your debt, or if you are ready to file for divorce, you should consult a divorce attorney in Orange County. The team at Yanez & Associates has experience dividing debts and assets in divorce, from the basics to those who file bankruptcy as part of their divorce. Contact us today with your questions, and we’ll schedule a free initial consultation so that you can get to know us, and we can answer questions and get to know you and your situation. Call us today! 2 What is Community Debt? 3 How is Debt Divided in California? 3.1 What if we have a mortgage? 3.2 What if we have credit card debt? 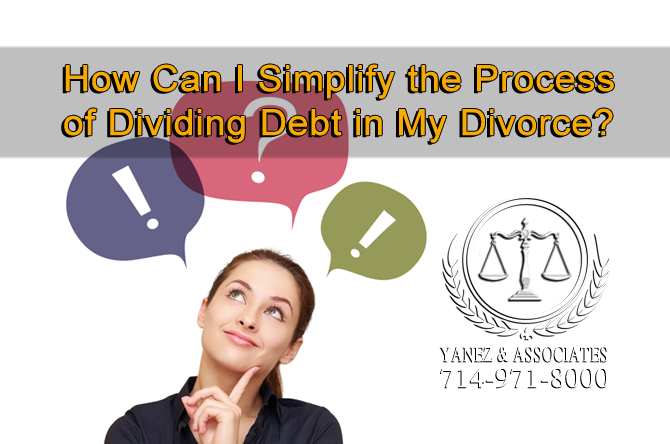 4 How Can I Simplify the Process of Dividing Debt in My Divorce? 5 How Can I Build Credit After My Divorce? How Can I Build Credit After My Divorce?, How Can I Simplify the Process of Dividing Debt in My Divorce?, How is Debt Divided in California?, How Is Debt Divided Upon Divorce?, How is Debt Divided?, How to Divide Debt and Property in an Orange County Divorce, Orange County Debt Division Attorney, Property and Debt Division, Splitting Assets In an Orange County California Divorce, What is Community Debt?, Who Pays the Credit Card in an Orange County divorce?